These types of machine slitting knives generally have either a single bevel, double bevel, compound singe bevel or a compound double bevel that comes to a sharp edge. Some circular slitters also have bevels that come to a blunt or square edge. The different edges are determined by the type of product being cut and the size of the final product. 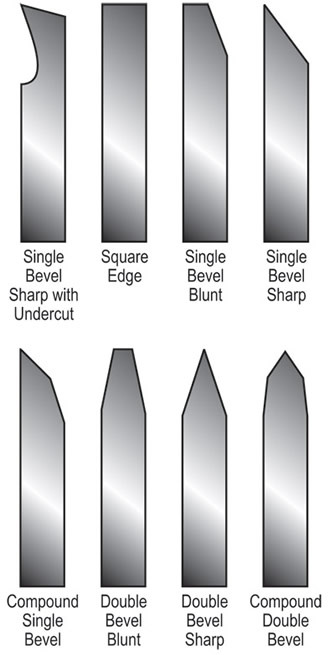 See examples of these types of bevels in the following drawings. These types of machine knives are generally used for what is referred to as burst or razor edge slitting. This is the type of cutting when the product being cut is moved past the knife which then cuts the material into two pieces. Cutting setups can range from a single knife attached to a holder to as many as 50 blades or more all mounted to the same arbor. Circular slitters cut through the product and into the air, slot or a soft supporting material, behind the product being cut. This is required because the sharp edge cannot be damaged , dulled or rounded by touching a hard surface. The sharpness of the edge and the rotational speed of the knife are what is required to cut the product. Call and let us suggest possible design and material changes to your current product, or allow us to make suggestions when you are designing a new machine. A combination of the properly designed edge and use of the correct material might greatly increase the life of your knives. Our normal delivery is between 3 and 10 weeks, which varies depending upon a variety of factors. It is not the 14-20 weeks needed when dealing with a foreign manufacturer. Remember the real cost of cutting any product, is not the individual cost of the knife but the down time and lost production involved when changing the knives because they become dull. • paper • plastic • fiberglass • food products • cloth & non-woven material • tape • rubber • foil • hydraulic hose • many other types of products.